Certain counties in Southern California have been under evacuation because of the fires that started on Thursday afternoon. The fire has threatened and destroyed many homes and businesses. Also being the cause events were canceled. The fires also caused many streets and highways to be closed down. The fires affected Students Run LA Lake Balboa 15k, which was going to take place on Nov. 11. It was canceled because of the air quality relating to the fires. Thousands of residents fled their home in Paradise, north of Sacramento, on Thursday, Nov. 8, escaping the blazing fire. According to NBC News the Camp Fire burned more than 20,000 acres and has destroyed the town. The largest fire is called Hill Fire, which started on Thursday afternoon in Ventura County. 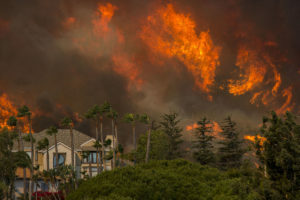 It started near the Santa Rosa Valley, about 10 miles northwest of Thousand Oaks. The fire kept growing and had reached 15 square miles by Friday morning. This caused the 101 Freeway to be closed down and have mandatory evacuations for California State University, Channel Islands campus. The other fire that started in Ventura County is called the Woolsey Fire near Malibu, which started at Woolsey Canyon and spread into the community of Oak Park early Friday, burning homes and forcing residents to evacuate. The strong winds and dry conditions caused the fire to burn about 12.5 square miles on Friday morning. The fire moved into Los Angeles County late Thursday, causing evacuation to take place in Westlake Village. Firefighters have done everything they can to stop the fires and continue to do so.